My best companion is no longer able to go out on rides with me. A week and a half ago, my bike was benched permanently. A longtime faithful companion across many miles fell victim to one too many traveling trips. It's fragile bent rear aluminum derailleur hanger now hanging off center from it's carbon frame, signaled that my beautiful bike would no longer be able to join me on bike rides. 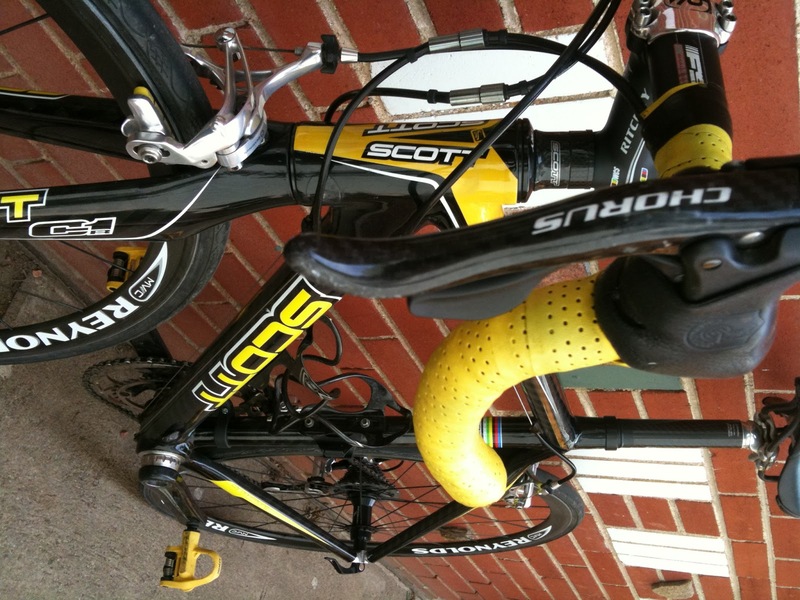 One too many bends, and replacement gets tricky for an old Scott frame model with a non-replaceable hanger. It is never a good time to loose a bike, but I have a trip to France planned in 5-weeks and I miss getting out for a spin 3-4 times a week. Oh my bike! I was so attached to you. I sat on my living room floor last week, as if coddling my frame, snapping pictures of it's ripped derailleur and bent stripped hanger, the only signs that it's future could only be that of a single-speed. Dash, a good friend talked me through the diagnosis, and the next logical steps, discouraging the sounds of whimpers coming from my end of the line. "There's no crying in cycling," he said. Yes I allowed those weary thoughts to creep into my mind - maybe it is time to give up cycling. This sport is so expensive, a new bike is so costly. "No" was the firm response from another dear friend Monica, "No," she made it clear to me, giving up is not an option. More emails and photos sent to my brother Mike in France, and contacts sent from Dash, set me on the right course of action. My whimpers lessened slightly, I had a plan. Contact Calfee Designs (www.Calfeedesign.com) in California to see if the aluminum/carbon juncture was repairable. Yes it would be fixable at approximately $700 and 3-4 weeks of repair time, (frightfully close in timing to my departure to France). For carbon repairs keep Calfee in mind, they offered excellent customer service. Brady Kappius is another resource and possibility for carbon repairs. A Colorado bike racer with a Bachelors of Science in Metallurgical and Materials Engineering from the Colorado School of Mines and a Masters of Science from the University of Colorado at Boulder, his company brokencarbon.com is a good resource to remember if you ever have a damaged carbon bike frame that needs repair. 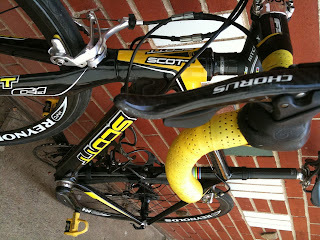 I sent off inquiries to Scott USA and a local Scott Rep - no responses yet. I also learned about crash replacement on frames - basically a lot of paperwork for the bike shop, time waiting for a low priority shipping, and in the end maybe 10-20% off the retail price of the frame. Although BMC offers up to 40% off replacement of their recent frames if you register your BMC bike within 30 days of purchase and then proceed to crash it. But I don't own a BMC road bike. I also learned that Specialized will offer crash replacements on frames other than their own - Specialized is smart - they want your new business. I also learned much from another friend Mike, who educated me on which bike frames where manufactured in which factories. I visited local bike shops in Denver to "test drive" bike frames and components (Turin - very helpful with good brands, Giant - great customer service and knowledge, and Big Ring - expensive with high-end brands). I had fun and learned so much. Lots has changed in bikes and components over the past 6 years. I had a Campy Record/Chorus mix on my old lightweight carbon bike, going down in quality is a hard pill to swallow. I wanted to find value for my dollar. I never expected my bike to run a parallel scenario to aging. I suspect why people spend a lot of money to buy faster cars and faster bikes as they age might do with overcompensation. Good hardware might ward off relinquishing to a downward slope. My simple formula is more age = better bike. I am not into appearances, I do not care to impress, I want ride quality/fun quality, and most important, as I conveyed to Scott at Big Ring Cycles in Golden, "I know you have lots of racers come in here, my only goal is to not fall over when I climb a steep mountain in France, can you get me there - not falling over?" I gestured as he followed my hands to the ground and then smiled. One thing is clear - buying a new bike takes more than money - it takes hours of time. It took hours to investigate and shop for what is next. It doesn't help that I have a very tricky fit, and can tell instantly when a bike is off even 3mm. My old bike was into it's 6th season. Should I keep the old components and move them onto a new frameset only? Or is it time to buy a complete new bike and sell off what is leftover? Inventory is low in June, what is in the stores and online shops is there, with little in reserve, 2013 models will be announced and released at Eurobike and Interbike in 2-3 months and appear in the shops shortly after. Some 2013 groupos are already in shops. Prices in local shops seemed to match those online, so why not buy local. Bike shops are in a pinch - wanting to dump 2012 models, but then risking having nothing on the floor to sell - jittery times for bike shops (although very busy times for mechanics). It is amazing how friends and family step up to help. Maybe they are simply trying to stop my bursts of crying, but it seems I had instant bike agents scouring the land to find me a replacement or loaner bike. I show up and allen wrenches magically appear trying to fit me onto any possible bike that functions and rolls. I never knew so many, were so handy, with tools. In the end, I bought a new bike. It was a big step. After plotting out the numbers and costs, asking a lot of questions and comparing my options. I decided that if my theory of $1 a mile for excellent fun stood true, than my old bike gave me closer to $0.25 cents on the mile worth of fun. Think about it - when I went out for a 50-mile ride, on average, I paid $12.50 for all that goodness. Cheaper than golf. (okay never mind that $55,000 private medical insurance medical tab I paid for my broken pelvis 1.5 years ago, that doesn't count - that was mountain biking). Now I have many more miles to ride to pay for my wonderful new bike. I also have motivation to get out there and enjoy such a fun riding high quality bike (and an excellent value). Finally we can put away those allen wrenches - come this Saturday - I will be bringing a new bike home from Big Ring Cycles. Anyone want a bunch of bike parts?